If as you practice you ever start feeling tension or stress, you know that greed has come in. If it is just the wholesome desire – which is chanda – then it feels fresh, alert, confident, clear; that’s what wholesome qualities feel like. It feels good to practice, you feel happy about practicing. It’s all positive; that’s why it’s called wholesome. And interest makes the continuity of awareness so much easier. When we know that something is good and we want it that’s wisdom. When we don’t know that something is good but we like it – that’s delusion and greed. For example, you meet a stranger and just by looking at the person and using your judgment, you say: I like this person; that’s greed. We don’t know the person’s character but already we judge him. But when we get to know a person and his good qualities; that’s when we know that something is good. 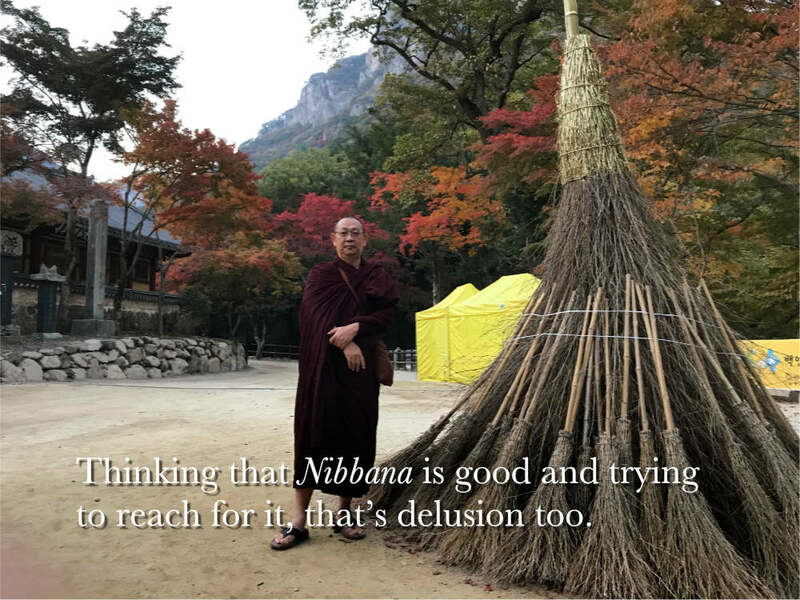 Thinking that Nibbana is good and trying to reach for it, that’s delusion too. So, when we don’t really know something, we can’t really want it. It’s only when we truly know that something is good that the mind will reach for it wholeheartedly. So, one of the first wisdom we need to learn from being mindful is that understanding is the benefit of mindfulness itself. In Burma, the youth who come to the centre to meditate say that when they’re mindful the quality of whatever they do becomes better; even when they fold their clothes, it’s neater. Sayadaw: If greed is happening, just recognize greed rather than replacing it with a mantra. It is because the mind is not contented that there is greed. So, recognize/know the greed but don’t follow it. And slowly it will change. Yogi: But that wanting and greed are so unpleasant. Sayadaw: Stay with that feeling of how uncomfortable it is to have greed. If you look at greed very closely as if you’re embracing it, it will make you feel so uncomfortable that you won’t want to be like that. Then the mind will just let go of it. A yogi related how he sat and watched pain for 1 hour. The pain came, increased and decreased and repeatedly increased and decreased. He said that his meditation was going in circles. Yogis should be careful that they don’t do wrong practice, i.e. practice continuously with lots of greed – then the more they practice, the more the practice declines. Meditation is all about the quality of your mind. If the mind is getting more and more wholesome, in whatever way you can make it more wholesome, you’re moving forward. If the quality of the mind is getting more and more unwholesome, then you’re going backwards, no matter how it is achieved. When people do wrong practice, especially when they practice continuously, you have to be even more careful – like when there is greed in the practice and you can’t get it, you get averse, and then there is more greed and you get averse, and people can do that throughout the day. And then if they don’t recognize it and they keep trying, they are trying with so much effort, the mind can get very intensely averse and unwholesome. When there’s continuous mindfulness, greed decreases because it doesn’t have a chance, there’s no time for it to come in. Because the mind is absorbed in this work, it doesn’t have time for it to do the other work. ◉ IS THE EXPERIENCE GOOD OR UGLY? If you watch with craving, you will think that the experience is good; if you watch with aversion, you will think that it’s ugly. If there is no craving or aversion, then what is it like? Whenever we focus, the mind is using the energy of defilements; it also loses awareness. That’s why we practice with gentle but continuous awareness. When you say that you focus well on the job, it means that you’re focusing on the object. When we meditate, we don’t focus too much. When you focus on the job, on the object, it means that there is craving. Because of craving, focusing is strong; and it has become a habit. Because of this habit, when you practice you also focus too much on the object. In daily life you lose awareness when you focus too much. In the retreat, we don’t concentrate or focus too much; just be aware, just know and maintain the knowing over a long time. Continuity of awareness is more important than focusing. For example, when you’re aware of seeing, you are not seeing external objects; you noticing that seeing is happening (the ability to see is happening). When you focus on the things you see, then you start to think about them and you lose awareness. Yogi: I notice more thinking mind when I practice this relaxed, observing method; I used to practice focusing. Sayadaw: This is the correct way. We can notice our thoughts better when we are more relaxed (use less energy); we want to know that thinking is happening. We want to know our thoughts; that’s why we don’t focus too much on the object. Before, because of focusing, the mind cannot think. So, you cannot be aware of your thoughts, you cannot be aware of your mind. Vipassana means we want to know both the physical and mental processes. Because this is our purpose – and thinking is a kind of mental process – we need to be more relaxed to notice the thinking mind. Don’t encourage this thought, it’s a greed thought and thinking of the result is never useful. Wisdom only thinks of what to do, craving always craves for the result. Now you learn how to become skillful in the practice; so, just practice, for without practicing how to end samsara? No point thinking about it. Now there is no skillfulness in the practice – you cannot maintain it after you go back from a retreat. It must be so skilful that you can not only maintain but also improve your practice in life, which is how skilful you have to be. How? Day after day, if we adjust our attitude towards the people we meet and the things we do by watching them through right view - watch our feelings until they subside, see this again and again day after day – we gather more and more right view. After a while none of the things we have to do, the people we have to meet are a problem anymore, right? Nothing is a problem if we remember to practice diligently in daily life. Yogi: Just out of retreat, the mind was clear and bright. After some time, the momentum dies off, quality of mind drops and more defilements arose. There was craving for strong mindfulness and going back to retreat practice. Sayadaw: Just recognize your motivation for practice. Every time craving comes, the mind needs to acknowledge it. Try to practice continuously. If craving comes and you notice it, then it cannot push you. Just focus on the practice, not expecting results. Pay attention to the way you practice, every moment, every time. If you practice right, the result naturally becomes better and better. You cannot stop defilements. Try as much as you can, but attitude is: try to practice. Don’t try to stop the defilements; that is the job of wisdom, not your job. No need to be afraid of defilements; if defilements come, so what? You can use as an object; no problem. If you don’t want defilements to arise, it is impossible because your mind quality is not pure enough. If defilements come, you do not follow – that’s enough. You don’t try to stop defilements from arising or follow the defilements; then you can see the nature of defilements, their cause and effect, and you can understand. But you didn’t save the money. The mind, cause and effect, and the conditions did all that. There are certain conditions that came together – you worked hard, you got the money and nobody stole it; so the money is still there. Okay, you made the effort, but the mind did all that. And if the conditions are not there, the money would not be there. Only when we consider it to be mine, then we attach to it very strongly. But if you see the conditions clearly that contribute to it, then there is less attachment because you see it as a process. Most yogis are busy concentrating: focusing, focusing, focusing ... looking for something, trying to see particular details. These mean that craving is pushing. The yogis use a lot of energy. If the mind is busy doing something, then realization cannot arise. If the mind is relaxed, not focusing, it’s easier for understanding to arise. Without craving, then wisdom can arise. When there is less defilements, then it’s easy for wisdom to arise. Yogis focus a lot because they like to see the object clearly; but we use the energy of awareness-wisdom to see clearly, not the energy of focusing. In a sit, yogis like to see the object clearly; they don’t like general awareness. Understanding in detail is the nature of wisdom. But people don’t have wisdom, they just focus. Seeing in detail because of focusing is not wisdom. Day by day, day by day, when the quality of awareness becomes stronger, naturally, yogis can see clearly. It is not necessary to focus to see in detail. Yogi: It is difficult to listen attentively to the contents of a talk and still be aware that listening is happening. Do I listen and at the same time remind myself by labeling ‘listening, listening’? Sayadaw: It is not necessary to label. Just be aware of the process. The mind is very fast; if you label then you’re holding back awareness. If you’re listening more, then awareness is weak because your awareness hasn’t become a habit yet. Now you start to be aware, right? The awareness is from personal effort. Listening is also from personal effort. Then awareness is difficult. When awareness becomes natural, you don’t have to force to be aware but awareness is already there, at that time it is very easy to be attentive to the talk and yet be aware. For beginners, when awareness hasn’t become a habit yet, it is very difficult because when the mind pays attention to outside job, awareness is gone. If you try to be aware inside, because you’re putting in 100%, you cannot do outside things; you cannot read a book, you cannot watch TV, you cannot listen to what others say because you’re only aware inside. Because you use all energy to force the awareness. That’s why I say don’t focus too much and make awareness a habit day by day, day by day; awareness is present, awareness is present. Then awareness becomes natural awareness, not from personal effort. There is no need for personal effort because natural effort arises due to momentum. Moment to moment, moment to moment awareness gains momentum and the awareness becomes a habit. When it becomes a habit, we don’t have to exert energy. At that time, awareness does its job and the mind also does its job. Then you can see clearly that both are working. Any time you come across difficulty – when you’re getting mired like quicksand, you can’t seem to get out – at that time always stop thinking. That is the time that you must stop thinking [and change to a neutral object like the breath or body sensation] and calm the mind because any thinking with an agitated mind is useless. It will just get you further and further into trouble; deeper and deeper into the same difficulty. When the heart and mind feel more at peace, and then you think about it, the mind is more rational, more reasonable, forgiving and gentle. Sayadaw: Ideally, the meditating mind should be pure without craving and aversion – that’s just the theory. In practice, it’s not possible in the beginning; we will have craving and we will have aversion. And if we have some practice, it’s only while recognizing the craving and aversion that is present. You see the craving; you are recognizing that the craving can be a hindrance; and that’s what we ought to learn. And if the mind sees this every time – craving arises and the way craving affects our mind, the way craving works in the process – it will come to the point that the mind understands that craving is not helpful. 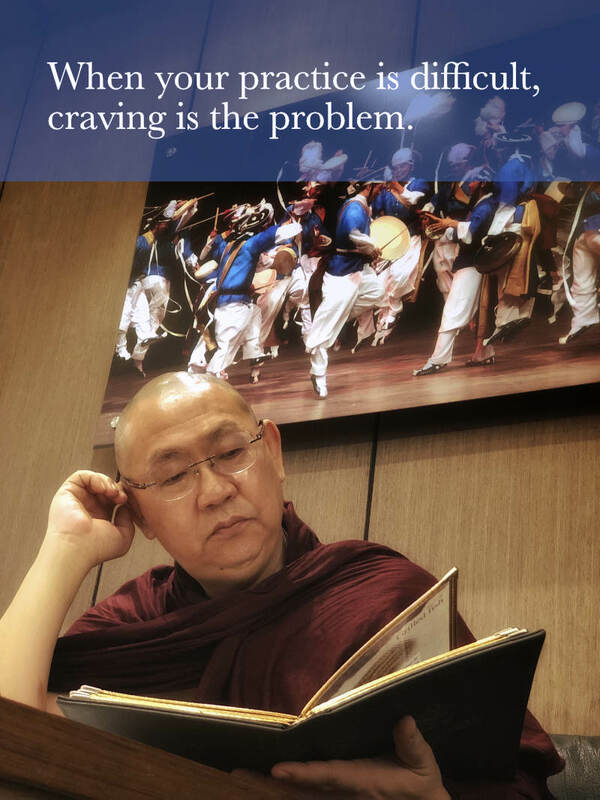 When the mind understands that craving is not helpful, craving will drop away. But until then we cannot intellectually get rid of craving. You can just know the process until the understanding hits the mind. The mind is like a pendulum. One side is craving and the other side is aversion. How much the mind swings to craving that is how much it will swing to aversion. That’s why the mind is never peaceful; it is always swinging. How much it can stop swinging is that much peace the mind experiences. When we are meditating, we should try not to follow our greed and aversion. When there is defilement, it is hard for wisdom to arise because we cannot watch the object in neutral light. Don’t use too much effort. Because of craving, aversion and delusion, that’s why you use a lot of effort. You need to check how much energy you use in being mindful. Also, because you need to practice the whole day, if you use too much effort, you cannot maintain awareness continuously even after an hour, what more the whole day. The key to mindfulness meditation is continuity of awareness because it develops natural awareness. We need this natural energy; we do not use personal energy all the time. In the beginning, we start with personal effort to be aware. But later when awareness gains momentum and becomes a habit, at that time natural effort grows more and more. If you are not aware about this natural effort, you will use too much personal effort. Then, meditation will not improve because the idea of “self” is present all the time. “I’m meditating; I’m meditating.” When awareness becomes natural, you don’t need to use force to be aware. At that time, nature is meditating; you are not meditating and the idea of “self” decreases. Meditation is anatta, non-self. Nobody is meditating because nature is meditating. At that time, anatta idea is very strong. Then your understanding will increase. So, natural momentum is very important. If you use a lot of energy all the time, the idea of self will not decrease. “I’m meditating, I’m meditating” then right attitude/right idea is not present.